DONETSK, Ukraine -- Nine months after the investigation into the destruction of MH17 started, there have been no answers and no justice for the victims - but tonight on 60 Minutes, more light will be shed on one of the cruellest acts of mass murder in recent memory. 60 Minutes will shed more light into the downing of MH17 tonight. 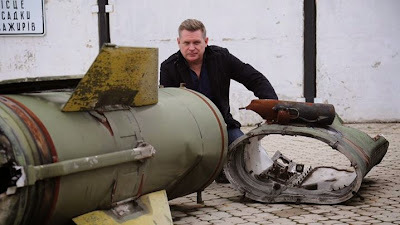 Reporter Michael Usher traveled to Ukraine and visited the site where the flight crashed into the earth, killing all 298 people on board including 38 Australians. He said the culprits "left enough footprints" to follow. Usher and the 60 Minutes crew worked on tracking the missile launcher believed to have shot the passenger plane out of the sky on July 17 last year, following it to all the locations it had been publicly seen since that day. The motivation was simple – justice and answers for the victims and their loved ones. “It’s been nine months but there are no answers and, seemingly, no justice,” Usher said. Usher and his team moved from regions controlled by Ukraine’s government across no-mans-land and to the so-called Donetsk People’s Republic, where Russian-backed rebel separatists are in command. Usher said the team had a great deal of difficulty crossing into rebel territory, where they were suspected of being spies. “They don’t want any attention at all,” he said. The rebels are the prime suspects for the destruction of the plane, with reports emerging in following days they had been taught to use the missile launcher by Russia. However, the rebels in turn claim the plane could have been shot down by Ukrainian forces in a “false flag” plot. “Politically, this is one of the most sensitive investigations in history,” Usher said. Despite the difficulties, Usher now believes the mystery can be solved. “It wasn’t easy, but I think we did get what we came for,” he said. Ultimately, there was only one question that needed to be answered.